St. Martin's Press, 9781250039019, 400pp. The USS Kentucky-a Trident ballistic missile submarine carrying a full complement of 192 nuclear warheads-is about to go on a routine patrol. Not long after it reaches the open sea, however, the Kentucky receives a launch order. After receiving that launch order, it is cut off from all counter-orders and disappears into the Pacific while it makes the eight-day transit to the launch site. What the Kentucky's crew doesn't know is that those launch orders haven't actually come from the U.S. government. Rogue elements within the Mossad have learned that Iran has developed its first nuclear weapon and, in ten days, will detonate it-and the target is Israel. The suspected weapon complex is too far underground for conventional weapons to harm it, and the only choice is a pre-emptive nuclear strike. 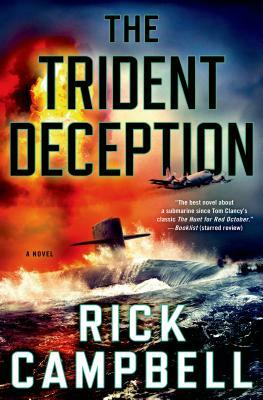 With limited time, this rogue group initiates a long-planned operation called the Trident Deception. They'll transmit false orders and use a U.S. nuclear submarine to launch the attack. Rick Campbell, a retired Navy Commander, spent more than twenty years on multiple submarine tours. On his last tour, he was one of the two men whose permission was required to launch the submarine's nuclear warhead-tipped missiles. Campbell is the author of The Trident Deception, Empire Rising and Ice Station Nautilus, and lives with his family in the greater Washington, D.C. area.